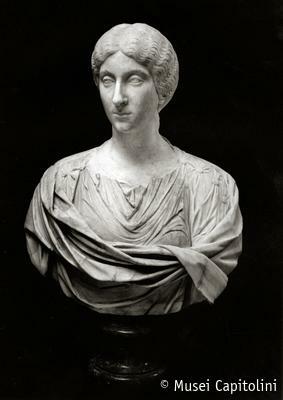 The female bust, clad in tunic and cloak, is cut down below the breast. The elongated face, slightly turned to the right, is characterized by wide eyes with heavy eyelids and tight lips. The wavy hair, parted in the middle, is drawn straight to the back where it is twisted in a knob. The coiffure, which became fashionable with the portraits of Faustina minor and Lucilla, dates the portrait to the late Antonine age.